Albuquerque: University of New Mexico Press, 1973. 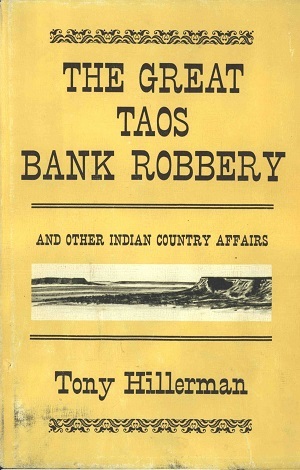 This is the first edition hardback of The Great Taos Bank Robbery And Other Indian Country Affairs. This 1973 edition was published by the University of New Mexico Press in Albuquerque, New Mexico. The cover illustration is by Dan Stouffer and features the image of mesas in a Southwestern landscape. Format: Hardback, 20.7 x 14.2 cm. Binding: Mustard boards with the author, title, and publisher printed in black on the spine.